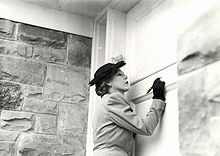 Mary Pickford signing the entrance to the Mary Pickford War Funds bungalow in East York, Canada. 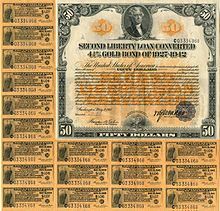 A Liberty bond (or liberty loan) was a war bond that was sold in the United States to support the allied cause in World War I. Subscribing to the bonds became a symbol of patriotic duty in the United States and introduced the idea of financial securities to many citizens for the first time. The Act of Congress which authorized the Liberty Bonds is still used today as the authority under which all U.S. Treasury bonds are issued. Securities, also known as Liberty Bonds, were issued in the aftermath of the September 11 attacks to finance the rebuilding of the areas affected. Apr 24, 1917 Emergency Loan Act authorizes issue of $1.9 billion in bonds at 3.5 percent. Apr 5, 1918 Third Liberty Loan offers $4.1 billion in bonds at 4.15 percent. Sep 28, 1918 Fourth Liberty Loan offers $6.9 billion in bonds at 4.25 percent. Interest on up to $30,000 in the bonds was tax exempt only for the First Liberty Bond. The 1st Liberty Loan Act established a $5 billion aggregate limit on the amount of government bonds issued at 30 years at 3.5% interest, redeemable after 15 years. It raised $2 billion with 5.5 million people purchasing bonds. The 2nd Liberty Loan Act established a $15 billion aggregate limit on the amount of government bonds issued, allowing $3 billion more offered at 25 years at 4% interest, redeemable after 10 years. The amount of the loan totaled $3.8 billion with 9.4 million people purchasing bonds. The response to the first Liberty Bond was unenthusiastic and although the $2 billion issue reportedly sold out, it probably had to be done below par because the notes traded consistently below par. One reaction to this was to attack bond traders as "unpatriotic" if they sold below par. The Board of Governors of the New York Stock Exchange conducted an investigation of brokerage firms who sold below par to determine if "pro-German influences" were at work. The board forced one such broker to buy the bonds back at par and make a $100,000 donation to the Red Cross. Various explanations were offered for the weakness of the bonds ranging from German sabotage to the rich not buying the bonds because it would give an appearance of tax dodging (the bonds were exempt from some taxes). A common consensus was that more needed to be done to sell the bonds to small investors and the common man, rather than large concerns. The poor reception of the first issue resulted in a convertible re-issue five months later at the higher interest rate of 4% and with more favorable tax terms. Even so, when the new issue arrived it also sold below par. This weakness continued with subsequent issues, the 4.25% bond priced as low as 94 cents upon arrival. Secretary of the Treasury William Gibbs McAdoo reacted to the sales problems by creating an aggressive campaign to popularize the bonds. The government used a division of the Committee on Public Information called the Four Minute Men to help sell Liberty Bonds and Thrift Stamps. Famous artists helped to make posters and movie stars hosted bond rallies. Al Jolson, Elsie Janis, Mary Pickford, Douglas Fairbanks and Charlie Chaplin were among the celebrities that made public appearances promoting the idea that purchasing a liberty bond was "the patriotic thing to do" during the era. Chaplin also made a short film, The Bond, at his own expense for the drive. The Boy Scouts and Girl Scouts sold the bonds, using the slogan "Every Scout to Save a Soldier". Beyond these effective efforts, in 1917 the Aviation Section of the U.S. Army Signal Corps established an elite group of Army pilots assigned to the Liberty Bond campaign. The plan for selling bonds was for the pilots to crisscross the country in their Curtiss JN-4 "Jenny" training aircraft in flights of 3 to 5 aircraft. When they arrived over a town, they would perform acrobatic stunts, and put on mock dog fights for the populace. After performing their air show, they would land on a road, a golf course, or a pasture nearby. By the time they shut down their engines, most of the townspeople, attracted by their performance, would have gathered. At that point, most people had never seen an airplane, nor ridden in one. Routinely each pilot stood in the rear cockpit of his craft and told the assemblage that every person who purchased a Liberty Bond would be taken for a ride in one of the airplanes. The program was successful in raising a substantial amount of money which was used to pay for the war effort. The methodology developed and practiced by the Army was later followed by numerous entrepreneurial flyers known as Barnstormers, who purchased war surplus Jenny airplanes and flew across the country selling airplane rides. World War I poster. "Remember Belgium--Buy bonds--Fourth Liberty Loan" - During World War I, Allied Nations relied for propaganda on images and accounts of German atrocities to motivate their citizens to participate in the war effort. In this scene, the silhouetted German soldier with his thick Kaiser mustache drags a young girl away while the ruins of the city burn in the background. 1919 Victory Liberty Loan drive steel medallion made from "captured German cannon". Vast amounts of promotional materials were manufactured. For example, for the third Liberty Loan nine million posters, five million window stickers and 10 million buttons were produced and distributed. The campaign spurred community efforts across the country and resulted in glowing, patriotically-tinged reports on the "success" of the bonds. For the fifth and final loan drive (the Victory Loan) in 1919 the Treasury Department produced steel medallions made from melted down German cannon that had been captured by American troops at Château-Thierry in NW France. The inch-and-a-quarter wide medallions suspended from a red, white, and blue ribbon were awarded by the Department to Victory Liberty Loan campaign volunteers in appreciation of their service in the drive. According to the Massachusetts Historical Society, "Because the first World War cost the federal government more than $30 billion (by way of comparison, total federal expenditures in 1913 were only $970 million), these programs became vital as a way to raise funds". Through the selling of "Liberty bonds," the government raised around $17 billion for the war effort. Considering that there were approximately 100 million Americans during that time, each American, on average, raised $170 on Liberty bonds. A fifth bond issue relating to World War I was released on April 21, 1919. Consisting of $4.5 billion of gold notes at 4.75% interest, they matured after four years but could be redeemed by the government after three. Exempt from all income taxes, they were called at the time "the last of the series of five Liberty Loans." However they were also called the "Victory Liberty Loan," and appear this way on posters of the period. The first three bonds and the Victory Loan were partially retired during the course of the 1920s, but the majority of these bonds were simply re-financed through other government securities. The Victory Loan, which was to mature in May 1923, was retired with money raised by short term treasury notes which matured after three to five years and issued at 90-day intervals until sufficient funds were raised in 1921. The likelihood of successfully retiring all of the war debt (within the amount of time) was noted as early as 1921. In 1927, the 2nd and 3rd, together worth five billion dollars, 1/4 of all government debt at the time, were called for redemption and refunded through the issuance of other government securities through the Treasury Department. Some of the principal was retired. For example, of the 3.1 billion dollars owed on the 2nd Liberty Bond, 575 million in principal was retired and the rest refinanced. At this same time, the 1st Liberty Bond still had 1.9 billion dollars outstanding in 1927 with a call date for 1932 while the fourth Liberty Bond, with six billion dollars, had a call date for 1932 as well. The first three Liberty bonds, and the Victory Loan, were retired during the course of the 1920s. However, because the terms of the bonds allowed them to be traded for the later bonds which had superior terms, most of the debt from the first, second, and third Liberty bonds was rolled into the fourth issue. As a result, the large majority of Liberty bond debt was still outstanding into the 1930s. The terms of the bond included: "The principal and interest hereof are payable in United States gold coin of the present standard of value." This type of "gold clause" was common in both public and private contracts of the time, and was intended to guarantee that bond-holders would not be harmed by a devaluation of the currency. However, when the US Treasury called the fourth bond on April 15, 1934, it defaulted on this term by refusing to redeem the bond in gold, and neither did it account for the devaluation of the dollar from $20.67 per troy ounce of gold (the 1918 standard of value) to $35 per ounce. The 21 million bond holders therefore lost 139 million troy ounces of gold, or approximately 41% of the bond's principal. This was the equivalent of $2.866 billion (in 1918 dollars), or approximately $220 billion at the 2012 price of $1600 per ounce. We conclude that the Joint Resolution of June 5, 1933, insofar as it attempted to override the obligation created by the bond in suit, went beyond the congressional power. However, due to Roosevelt's elimination of the open gold market, the Court ruled that the bond-holders' loss was unquantifiable, and that to repay them in dollars according to the 1918 standard of value would be an "unjustified enrichment". The ruling therefore had little practical effect. ^ The Electric Journal, September 1917, p. 51. ^ The Financier, June 23, 1917, p. 1741. ^ New York Times, November 20, 1917. ^ Investment Bankers Association of America Bulletin, Vol. VII, No. 2, October 1, 1918. p. 30. ^ Abbott, Charles Cortez (1999). Wall Street and the Security Markets. Harvard Economic Studies, volume 59. Harvard University Press. ^ The American Year Book: A Record of Events and Progress, Volume 1918. T. Nelson & Sons. 1919. ^ Stone, Oliver; Kuznick, Peter (2014). The Untold History of the United States, Volume 1: Young Readers Edition, 1898-1945. Simon and Schuster. ISBN 9781481421751. ^ The Four Minute Men of Chicago. Chicago, Illinois: United States Committee on Public Information. 1919. p. 25. ^ New York Times, March 27, 1918, page 4. ^ a b Los Angeles Times, October 5, 1922, page IV9. ^ Massachusetts Historical Society, Focus on Women and War, June 2002. ^ Kang Sung Won, Rockoff Hugh, (2006), "Capitalizing patriotism: the Liberty Loans of WW1", NBER Working Paper No. W11919, 55p. ^ Special to The New York Times. (1919-04-14). "New Loan Fixed at $4,500,000,000; Interest at 4​3⁄4%" (PDF). New York Times. Retrieved 2012-03-29. ^ Garbade, Kenneth D. "Why the U.S. Treasury Began Auctioning Treasury Bills in 1929." FRBNY Economic Policy Review, July 2008. ^ Records of the 73rd Congress of the United States, Session I, Chapters 46-48, pp. 112–3. Chase, Philip M. (2008). William Gibbs McAdoo: The Last Progressive, (1863--1941). ProQuest PhD dissertation. p. 130ff. Garbade, Kenneth D. (2012). Birth of a Market: The U.S. Treasury Securities Market from the Great War to the Great Depression. MIT Press. pp. 69ff, ch. 5. Hart Jr, Henry M. "The Gold Clause in United States Bonds" Harvard Law Review 48 (1934): 1057. Hollihan, Thomas A. "Propagandizing in the interest of war: A rhetorical study of the committee on public information." Southern Journal of Communication 49.3 (1984): 241-257. Browne, Porter Emerson (1918). A Liberty Loan Primer. New York: Liberty Loan Committee, Second Federal Reserve District. OCLC 2315245. Lee, Higginson & Co. (1920). Liberty Bonds: A Handbook. London: Higginson & Co. OCLC 318644142. 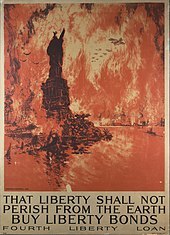 Wikimedia Commons has media related to Liberty bonds.